Thread: How does EVH look to you ??? I would never guess that is Eddie Van Halen in that picture. Glenn is this really necessary? The photo or the discussion? He doesn't look right to me. Perhaps it's the hat that throws everything off. At least I hope that's what is going on in this photo. I will say why I started this thread. To me , IMHO he looks sick. Way different than the birthday pics. My father in law died a few years ago of lung cancer. Ed has that same look in his face as my father in law after a few chemotherapy treatments. That's all ... I just wanted others opinions as to what they thought he looked like. I wish nothing but great times in Edwards retirement . Somethings not right.... He just got that plate and it expires in December of 2019? Lol. Maybe he just took it off for the photo. Prob on prednisone based on the appearance. Not a big deal. Dude is a LEGEND to the 100th degree. Enjoy every day Edward!! *I sorta feel bad that this thread was started (after reading the post above). If the title was "Check out Eddie getting ready to ride!" ok, but to start a thread because you think he looks sick and on chemotherapy just seems wrong man. One of my best friends who just turned 35 is undergoing chemotherapy for Stage 4 colon cancer that has spread to his liver. I would never in a thousand years post pics of him deliberately because I thought he looked sick. Gotta remember bro, these are real people, not super heroes. I know your intentions are good, but this will somehow end up as a bad thread. Last edited by EJC; 04.17.19 at 05:05 AM. Mods can close at anytime . Vanity plates expire yearly, regardless of when it was registered. You could register it on December 28. You'll have to re-register it in 3 days. I know because I have one. 21 years old and dad has thrown him the keys to the car!! Maybe he’s having arthritis problems in his phalanges and is on a steroid for that. Wouldn’t be completely surprising or out of line for a 64 year old guy that’s made a living with his hands. 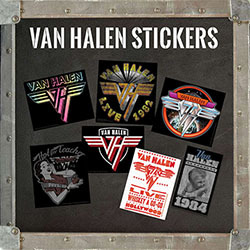 Have we really reduced ourselves to talking about how EVH looks? REALY!? Is this the best we can do? Don’t we have jobs and lives to live?